5M-425x15 XP Timing-Scooter drive belt. Replaces standard duty "HTD 5M425x15" Motor Belt. Home > Scooter, Golf, and Karting Belts > 5M-425-15-XP Synchro-Link Timing belt. 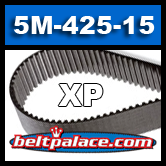 5M-425-15-XP Synchro-Link Timing belt. Industrial Power, Go kart, Scooter belts. Category: Bando Synchro-Link XP HT Neoprene (Metric). Belt Measurements: 425mm Length. 15mm Width. 5mm Belt Pitch. 85 Teeth.